Unfortunately, the automated email system of the 3DPrinterOS Cloud Slicing software will notify you via email as soon as you print has been completed. This does not account for or align with Maker Commons’ harvesting schedule. It may take up to 24 hours after you receive the “Successful Print!” email for your print to be ready for pick up. 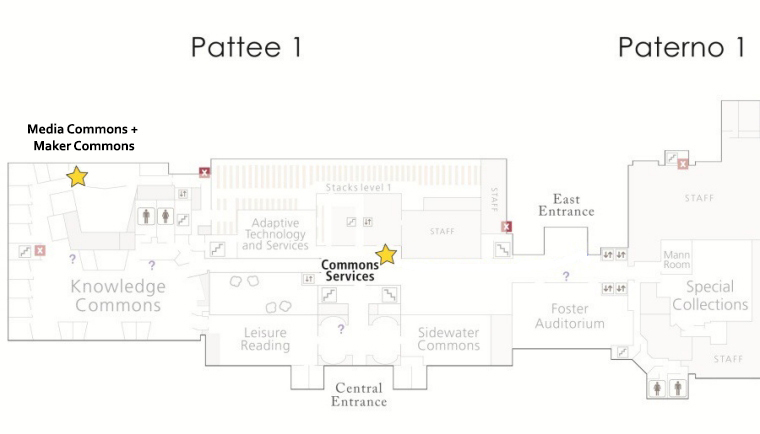 At that point in time, you can pick up your print at the Commons Services desk on the first floor of the Pattee/Paterno Library. You will be asked for your name and Penn State access ID in order to retrieve your print (example: xyz1234@psu.edu). The Commons Services desk is open 24/5, only closing at midnight on Fridays and midnight on Saturdays during the regular semester. You may pick up your print at any point during their open hours. For detailed availability information, please see the Knowledge Commons listing on the Libraries’ Hours and Locations page. If you do not need the envelope your print arrives in, please give it back to the person at the Commons Services desk or bring it to the Maker Commons and we will reuse the envelope for a future print. If you have questions about the way your print looks or was produced, please schedule an appointment with the Maker Commons to meet with a consultant and discuss your print. You can submit an appointment request using our Appointment Request Form.